September 21, 1869 letter sent by J. W. Austin of Roxbury, Massachusetts, to Cousin George in Winslow, Maine. I believe J. W. Austin is James Walker Austin, son of the author William Austin and his wife Lucy (Jones) Austin. Surnames mentioned in the letter are Jones and Draper, and these surnames occur in the family of James Walker Austin. His mother Lucy was the daughter of Peter Jones, Jr., and his wife Catherine (Hay) Jones. Lucy (Jones) Austin had a sister Anna Tufts Jones, born in 1799 in Charlestown, who married Samuel Draper; she is likely the aunt mentioned in the letter. Anna Tufts (Jones) Draper lived until 1883. As far as Cousin George in concerned, it happens that Peter Jones Jr. had a sister named Lucy, who married Joshua Cushman and had a son Charles. Charles married Jane Hayden and had, among other children, a son George Webster Cushman, born in 1838 at Winslow, Maine. I believe George Webster Cushman is the recipient of this letter. 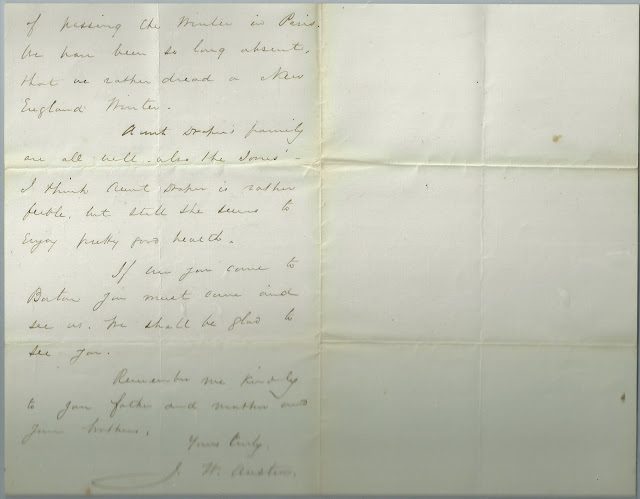 Another clue to the author of the letter is that fact that he and his family had been West and were not looking forward to a "New England Winter", as you would expect from people who had been living in the Sandwich Islands for nearly twenty years. James Walker Austin was born 8 January 1829 in Charlestown, Massachusetts, the son of William and Lucy (Jones) Austin.He got his law degree at Harvard and was admitted to the Suffolk Bar in 1851 but that same year left for California and then the Sandwich Islands. He was admitted to the bar there and became District Attorney in 1852. Subsequently he was elected to the Sandwich Islands Parliament and was once the guardian of the heir to the throne, Lunalilo. He left the Sandwich Islands in 1872 so that his children could be educated in Massachusetts. He then rejoined the Suffolk Bar and later became a Judge in Massachusetts. 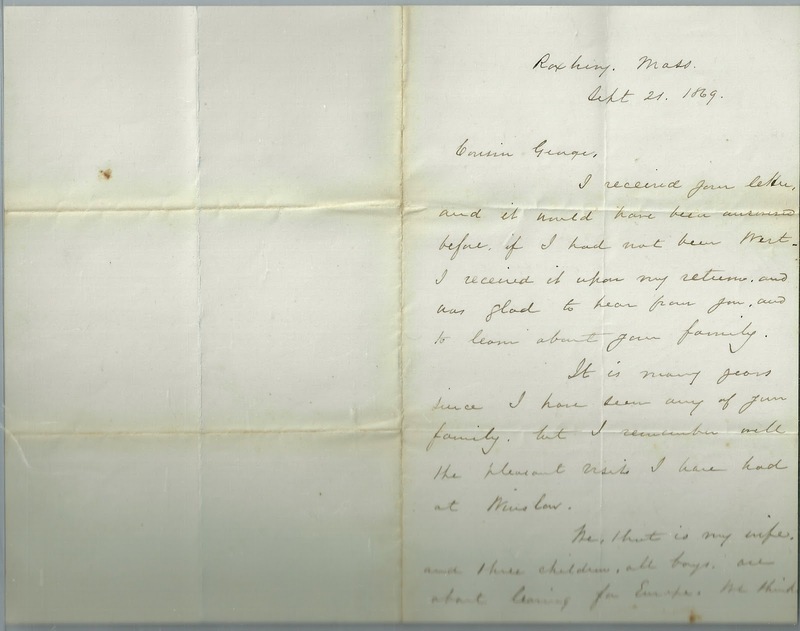 It's my hope that he came home to Roxbury in the fall of 1869, as well, so that he could write this letter to his cousin George. James Walker Austin died at Southhampton, England in 1895 in Europe while touring with his wife and daughter Edith. Here's a short, but excellent, biography: James Walker Austin. As for George Webster Cushman, he married Lucy Jane Ireland on June 5, 1869; they had at least two children. George worked as a farmer and carpenter and lived a long life. I received your letter, and it would have been answered before, if I had not been West. I received it upon my return, and was glad to hear from you, and to learn about your family. It is many years since I have seen any of your family, but I remember well the pleasant visits I have had at Winslow. We, that is my wife and three children, all boys, are about leaving for Europe. We think of passing the winter in Paris. We have been so long absent, that we rather dread a New England Winter. Aunt Draper's family are all well - also the Jones'. I think Aunt Draper is rather feeble, but still she seems to enjoy pretty good health. If ever you come to Boston you must come and see us. We shall be glad to see you. Remember me kindly to your father and mother and your brothers. If you have any corrections, additions or insights regarding the information presented above, please scroll down to the bottom of this page for the comments box or contact me directly. Thank you for this letter. My name is Katharine Austin, and I believe James Walker Austin is my paternal great great great (great?) uncle. My great great great grandfather was Francis Boylston Austin, Sr. His children, with Ellen Louisa Whiting, was Francis Boylston, Jr and Kiameche Cecilia Mason. Thank you for taking the time to comment. Can you take another look and let me know if you notice any errors? Thanks! There are a couple other posts featuring letters that George Webster Cushman wrote to his parents in the late 1860s.